Stella the Waterdog returns. She has some thoughts on her home in Cascadia, a more romantic name, she thinks, than Pacific Northwest. The Columbia River defines the region, and the delta that forms the confluence of the Sandy River and the Columbia is one of her favorite places to play. Stella came to Oregon just a year and half ago. 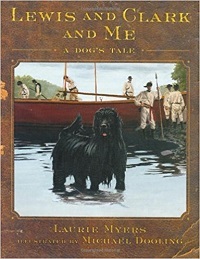 She learned of the big Newfoundland named Seaman who explored with Lewis and Clark on their expedition from the Mississippi River to the Pacific Ocean. Needless to say, she quickly became enamored with Seaman. 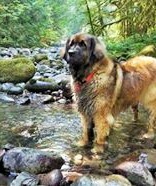 At her suggestion, what follows is a brief history of the Columbia River. Volcanos created the Columbia River. A geologist would quibble. Technically, the lava flowed from linear fissures, or vents, and reached as far the northern Willamette Valley, breaching the Coast Range and pouring on to the continental shelf. Flood lava kept flowing and filling the river's ancient channels; but the river kept finding an easier path, moving steadily to the north. So, rather than debouching into Yaquina Bay at Newport, the mighty River of the West ends its long journey at Astoria. We struggle with numbers we cannot imagine. 100,000 people fill a football stadium, and gives us a notion of this number. A million years leaves a blank. Geology seems rife with such numbers. 4 billion years ago the planet came to be. 62 million years ago came the extinction of the dinosaurs. Several million years ago, Oregon began to look, geographically, as it does now. One exception to this view, of course, is the Columbia River Gorge and the river that runs through that gorge. 20,000 years ago, the Columbia had carved a deep V-shaped channel through the basalt flows. Its banks rose gradually up through the high plateaus to glacier covered peaks. No evidence of a native people exists for this period; but some anthropologists and other scientists think a date of 20,000 years before the present is not impossible. The climate was 6 - 8 degrees colder for the last ice age still held most of North America in its grip. A gradual warming of the planet that ended that age began to erode an ice dam in Montana. That dam held back a body of water nearly the size of Lake Erie. The collapse of the dam and the sudden release of such a large body of water created the greatest flood the planet has ever known. Not just a singular event, massive flooding of this type happened many times over several thousand years. 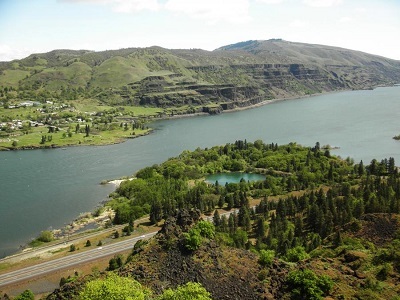 Named the Bretz Floods for Harlan Bretz, the geologist who first proposed the idea of such floods, these great flows created the Columbia River as we know it today. The V-shaped river valley was scooped and dredged by a rush of water 800 feet deep, and the U-shaped gorge we see today resulted.